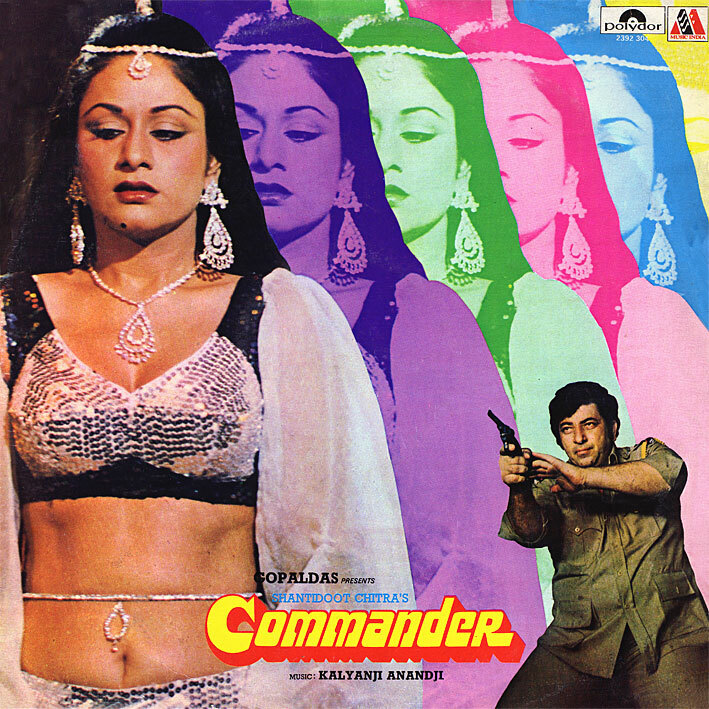 Kalyanji Anandji's 'Commander' is one of those highly sought after soundtracks that many collectors are/were willing to shell out a sizable amount for. Myself included at one point, although luckily I managed to keep my cool until a reasonably priced copy came along. So what's all the fuss about? Besides a fantastic looking cover, it's essentially the two electro tracks, 'Itni Jaldi Kya Hai', and 'Dance Music'. And while I do quite like both, I suspect I belong to a minority that considers them somewhat overrated. Not at all bad, just not the hyped-to-high-heavens killers I was expecting. Asha's is quite laidback and loungy, has a cool rhythm pattern and some nice synth bits, and there's an airy vibe to it that I appreciate, but it's dragged down by a mediocre melody. And a most unconvincing male chorus. The instrumental has Donna Summer written all over it, not entirely dissimilar to her 'Love To Love You Baby'. Faked orgasms, sound affects (bird noises) and a cool groove, but lacking in... something. Momentum perhaps. And the same daft sounding chorus, doing its best to quash any sense of eroticism. As for the rest of the score, it's fairly standard stuff. 'Duniya Wale' is quite pleasant though. Download and disagree with me. I loved those two most popular tracks... I remember the dance music was posted on Phil's blog a while back, and litlgrey put me on to the "Itni Jaldi" track which was on a Disco Hungama compilation LP that was upped somewhere else. I'm sure the rest is diametrically different from these two tracks as is typical in Bollywood soundtracks, but I'll grab it and see. Thanks a bunch for this one PC! Gonna check it out now! I do like the Title Music though. Gasp! I just discovered your blog yesterday and I've been plundering it ever since. Simply put, it's one of the best sites in the history of the internet. Astonishing! I don't know much about Bollywood music except that I love listening to it. I look forward to discovering many treasures you have posted already and ones in the future. Thanks so much for your effort. Thanks for the lovely feedback; glad you found the blog and are enjoying it. Thank you, thank you, thank you for posting this. I have (quite literally) been looking for this album for the last 30 years. Saw this movie when it first came out when I was thirteen and recorded 'Mere Yaar Bina Pyar' with my handheld cassette player up against the tv. Every time I have been to India or anyone I know goes I send them on an almost mythical quest for this album be it Ahmedabad, Bombay, Delhi or Madras. And everyone comes back empty handed much to my dismay. Suffice it to say I had given up hope of ever getting this, ever. I don't remember anything about the movie or the other songs - in fact the movie was quite terrible from the few memories I have of it. But I am the world's biggest Kishore Kumar fan as well the world's biggest Amitabh Bachchan fan. AB popped up as a guest star for this song (in an unbilled performance) and just knocked it out of the park. It happens at the 3:48 mark when it turns into a bhangra (the only known bhangra that Kishore has ever sung). Hey PC, love the cover with Aruna Irani and also 'Itni Jaldi Kya Hai'. Apart from that, not my cuppa of tea, I must admit. Looking forward to your next instalment though. Happy to be of help, Sanket. Is the movie itself obscure/hard to find as well? I couldn't find a single clip from it on Youtube, that's quite rare. Veen, I just noticed your blog and downloaded the Burman soundtrack (check it out folks) - great stuff! Yep, movie is just as hard to find. I was going to do the ol cassette player to computer trick that I had tried years before to get that song but as you noted - it's just not available anywhere. If you do find then please write me back about it - the Amitabh cameo is well worth the price of the DVD! Thanks for the rap PC. Much appreciate it. Veen---Parveen Babi is one of my favorites. You have an excellent namesake! Well, to me, longtime fan of the more trad pre-80ties Bolly, this disco/electro stuff is quite a surprise - a laugh-out-loud-one! Tnx; I keep discovering new stuff all the time here. Thanks for bringing this to the masses. You know, for me the twisted visuals kind of enhance my enjoyment of the song, lol! You're right Symaster, they do. The male chorus doesn't come across as any less daft though.